jillosophy: A friend reports on the Day of Angst - uh, "rage"
On Saturday I took a trip down to the Financial District to observe the so-called “Day of Rage”, the anti capitalism rally that was organized by the computer hacking website, “Anonymous.com” and the anti capitalist group, “Addbusters”. The rally was spread over much of the Financial District and over the course of the day it shifted to several locations, among them; the Charging Wall Street Bull statue at Bowling Green, the corner of Wall Street & Broadway at Trinity Church, The Museum of the American Indian and finally Zuchotti Park, which catty corners across from Ground Zero. Both the Charging Bull statue and Wall St & Broadway locations were barricaded and surrounded by NYPD officers but early on the crowds occupied Bowling Green (around the Bull statue) as well as the steps of the American Indian Museum. Later in the day they would also take over Zuchotti Park. 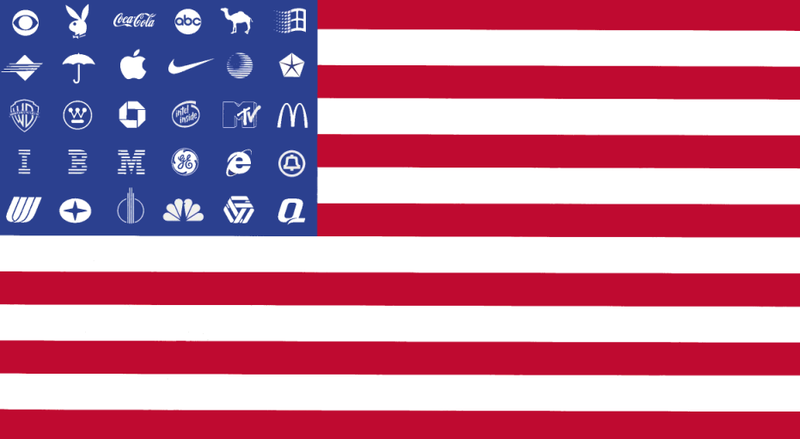 I noticed several variations of the anarchist and socialist flags as well as the ‘Adbusters’ mockery of Old Glory that has corporate logos in place of stars (see attachment). Also large numbers of young people with faces covered with keffiyehs, bandannas and a variety of Guy Fawkes masks. The “Free Palestine” crowd was there as well as a large ‘Free Troy Davis’ contingent (the Left’s 21st Century ‘Mumia’). At about 1:30 PM, a group of mostly young men wearing the aforementioned variety of masks, attempted a loud chanting sit-in, blocking all pedestrian traffic directly in front of the police barricades posted at the Wall St & Broadway location. The group was easily removed by the officers present. By late afternoon the crowd had marched up from Bowling Green to Zuchotti Park. By then their numbers had swelled significantly from the hundred or so they started out with to something closer to a thousand. At the Park, a group called the ‘Primetime Brass Band’ was performing patriotic tunes for passing tourists when the lefty crowd began to surge into their area. 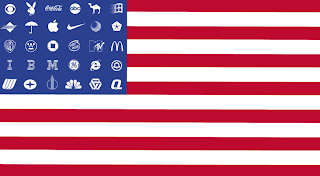 The leader of the band periodically told the crowd that the band was NOT affiliated with the anti American group behind them and he had to make that disclaimer because several of the moonbats were deliberately marching between the band and its audience with their anti capitalism signs. One old commie, waving a big red socialist flag directly behind the band, requested they play ‘The Internationale’ – predictable! Later at home, I heard on the news that Mayor ‘Softy’ Bloomberg would not allow the crowds to camp in Zuchotti Park but would permit them to sleep on the sidewalks outside the park, provided they did not block pedestrian traffic (Mayor ‘Softy’ never did oust the crowd from the park – they were allowed to spend the night there). Btw, since none of this was done with an official NYPD permit and since the punks aren’t going away, I wonder how Mayor ‘Softy’ will deal with the situation on Monday when Wall Street HAS to reopen for the returning Stock Market workers. If the rally morphs into a mob, will the Mayor man-up and activate the Mounted Police and Riot Squads? Just curious. PS: the attached photos are from online news sites – I did not take pictures.